Not sure why red leaflets keep popping through the letter box chez Crossfields. It's not as though Labour aren't going to win the local election anyway, and voting Labour in local elections is not going to get rid of this awful Tory government! According to one of the flyers, local ward councillors Brenda Dacres, Joe Dromey and Paul Maslin are standing up "for the many not the few". But living in Deptford, one wonders who "the many" are, since Deptford isn't mentioned once in their flyer. In the other flyer, New Cross Labour are announcing a 'radical' manifesto. Deptford's mentioned twice, but only in the small print. Apparently Paul Maslin grew up here (though he doesn't live here anymore) and is "a partner in an art gallery". That'll be the one that used to be on Deptford High Street which he sold up to move to trendy Shoreditch; the lovely cafe and gallery that he flogged to "Jennings The Bookmaker" who sold it on to Coral, which precipitated an escalation of betting shops arriving on the high street that the rest of us then had to fight off. Thanks, Paul. Deptford is also mentioned in the boast that New Cross Labour "secured the return of the Deptford anchor to our high street". What high street is that then? New Cross High Street? In any case, as local artists and residents who did most of the work to bring back the anchor have logged in full, it took four years and a petition of 4,000 people before Lewisham Labour agreed to return it. New Cross ward councillors played only a small part. With the mantra "For the many, not the few"(a phrase first coined by New Labour in the 90s) we presume they mean the self-serving 'one per cent' who hold all the power and wealth. But the left has always championed the minority, surely. So what about when "the few" are tenants and leaseholders who don't want to be forced out of their homes so that Lewisham can house "the many" in their expensive 'place-making' vanity projects? In its Green Paper on Housing, Labour promise to reverse all the damaging Tory housing policies of the past few years, but this may not be radical enough, as estate regeneration (demolishing perfectly sound homes) is still on the agenda. Having helped create the housing crisis by sitting on land without developing it and keeping prices artificially high by failing to build, the building industry must be wetting itself at the prospect of the profits it'll make out of all the new house building Labour proposes – just as it did in the 1960s, when it jerry built masses of social housing that later had to be demolished. • Introduce ballots on any estate regeneration scheme that includes replacing existing homes and back this up with a Residents' Charter that guarantees all residents the right to remain on their estate, and which guarantees an increase in genuinely affordable housing. Blimey, that's three bullet points in one, surely? First of all, what do they mean by "replacing existing homes"? Surely they mean "demolishing people's homes", don't they? Afraid to say the word? Afraid to admit the environmental impact and massive carbon footprint that word evokes? Say demolition, that's what you mean! The rest of this garbled statement indicates that ballots will be worded so unintelligibly that residents threatened with demolition will hardly know what they're voting for. This sounds good, but does it include Housing Associations (which are private until a change of government un-privatises them again)? And haven't they already sold off ALL the strategic land in Deptford to private developers (with council estates the only land left to redevelop)? Will the financial details of council-led partnerships with private developers be open to scrutiny? And are 'genuinely affordable homes' genuinely affordable? Much of this is led by conditions of GLA grant funding it seems. But whatever now seems 'right' makes what has gone on previously look terribly 'wrong'. The new Mayor will still have to preside over the results of decisions made by the previous administration (when he was Cabinet Member for Housing and these rules did not apply). Or are they actually proud of schemes like Heathside & Lethbridge where 328 social tenants were forced out and took priority on the waiting list, pushing those already on it further down it, so that Family Mosaic could build 616 private homes? This must refer to the mass of publicly owned land down in New Cross Gate at Besson Street. A great place to build new social homes, you'd think. But no, this is where Lewisham Labour has decided to enter the Private Rental Sector through a joint venture (50/50) with Grainger plc, "the UK's largest listed residential landlord”. The deal is to build 232 units, of which 65% will be let at market rent levels, and 35% as Living Rents. None of the tenants will be drawn from the Council’s housing waiting list. Tenancies will be a minimum of 3 years and maximum of 10. The Council call their "35%" of this development ‘affordable’, as that’s what the GLA call it. In fact Living Rent is one of three types of what the GLA call “genuinely affordable” homes. They describe the London Living Rent as "homes for middle-income households"not earning above £60k p/a and the rent depends on where you live. Lewisham Council, on the other hand, claims that “Living Rent” is linked to the London Living Wage. It assumes that two earners occupy each flat, each paying 35% of their net income on rent. In other words, it can only be described as affordable if you share a flat, which many people do of course. But if you're a single mum or dad, you won't be able to afford a two bed flat for you and your children on your Living Wage take home pay of £326p/w when the Lewisham benchmarked London Living Rent is £225.46. Nor will you be able to afford to sleep with the children in the same room when a one-bed flat is £202.85. This development's not for them. How did this get past Cllr Dromey who claims he refuses to support any scheme that does not include "genuinely" affordable housing? Especially when 65% of homes will be at market rent levels and all the cash is going to a private company? A tidy profit on public land for Grainger plc –who met the Council at a speed-dating developer event at the Shard in February 2017. How can Dromey ignore the angry locals who are disappointed that a site which originally contained council housing (demolished in 2007) is not providing any homes for social rent when the area has so many low-income people in need? Of course middle class or middle-income people need affordable homes too, but it's really annoying when your councillor votes to demolish people's homes and keeps banging on about building new social housing to get people off the waiting list. In the deal with Grainger PLC, the Council won’t be selling the land, but rather “investing” in it, and topping up its revenue with the rental income stream to fund services. Although they claim they don’t plan to try this elsewhere, the proposed partnership allows for a similar venture to happen on other sites without having to choose another business partner, so it’s probably a pilot project that may see more unaffordable housing on public land elsewhere in the borough. So much for that waiting list! The idea of not selling off public land sounds good, but actually this kind of scheme is a bit alarming. Global corporate landlords and private equity have been waiting for opportunities like this – for state owned land to fall into private hands, ripe for the plucking. Such entities are already benefiting from tax exemptions facilitated by the Tory government's introduction of Real Estate Investment Trusts (REITs) where the biggest profits are currently being made in student accommodation, and purpose-built student housing REITs are now listed on the stock exchange. Perhaps Lewisham are partnering a REIT in their plans for Achilles Street in New Cross, where they want to demolish recently built student accommodation, 87 council homes and 15+ businesses in order to build 90 extra 'social' homes and a massive tower of new student accommodation. The options presented to residents were to 'do nothing', or 'retain existing homes and add 22 new ones on underused spaces', or 'comprehensively redevelop the area' (aka comprehensively demolish the area). Unfortunately for those whose homes and livelihoods are threatened and who haven't been able to make any plans for two years, the Council have made clear what their favoured option is (the latter) whilst also saying no decisions have been made and that all options are still being considered. This is your lovely Labour Council! Another initiative the Tories came up with to feather their nests is Build To Rent, a current example of which is the two towers going up on Deptford Creekside by Essential Living. All homes to rent, financed by global fund managers M3. But private equity firms are all too lightly regulated and far less accountable to tenants, the parent company being off-shore and answerable to no one. With the growing privatisation of public housing and the recent shift towards renting because no one can afford to buy, such companies are poised for a take over of London's privatised 'affordable rent' stock. Regeneration of our housing estates where councils partner with massive private interests on public land could lead to the mass transfer of social and public housing to the private sector. Just like the NHS. Academics have shown that the shortage of housing and corresponding boom in UK house prices and rents has been carefully prepared and legislated for over a number of years, and Labour have been complicit in it. As far back as 1998, New Labour's Urban Task Force led by architect Richard Rogers embraced American ideas of gentrifying the inner cities by building on brownfield land in Towards an Urban Rennaissance. But it was Lord Adonis in 2015 who put the nail in the coffin, with City Villages: More Homes, Better Communities, which advocated building hundreds of new "city villages" on existing council estates because the boom in land and house prices would enable local authorities to leverage their land ownership in partnership with private and voluntary sector developers (who are now privatised). The Tories promptly redesignated council estates as 'brownfield'. Lord Adonis’s 2015 report includes a paper by the outgoing Mayor of Lewisham Steve Bullock and the former Leader of the Council Barry Quirk. They allude to the “personal attachment and belonging – to a locality, to a place” and then go on to say “most of us will move home at some point as our personal circumstances change and develop”. Yes, but we are hopefully in charge of such choices. They conclude that “developing more urban villages within London over the next 10 years will not only give people more places in which to live, it will give them more homes in which they can build belonging.” Tell that to the people you want to forcibly removed from their homes who already belong! When Cllr Dromey talks about the huge number of people desperate for affordable housing, he falls into the same trap as everyone else – that the only answer is to build more housing. But, as Architects for Social Housing (ASH) argue, the housing shortage in London is a crisis of affordability, not supply, and building more homes does not push house and rental prices down. Estate regeneration is not a solution – on the contrary, it is helping to produce the crisis: "The motivation for demolishing and redeveloping estates is not the housing of London's rising population at higher densities in more and better homes, but to provide investment opportunities for global capital and the enormous profits to be made from building high-value properties on some of the most valuable land in the world." ASH are particularly critical of Labour councils who present themselves as opposed to Tory attacks on social housing while they continue to demolish estates and claim refurbishment is financially 'unviable'. It is not just Tory policies such as Right To Buy, Housing Benefit capping, Help to Buy, Rent to Buy and the failure to regulate private developer's viability assessments that contribute to the lack of affordable homes, but also GLA grants to private Housing Associations to build affordable housing for private sale, local authority funding for estate regeneration schemes and the transfer of public land into private ownership. They're all privatisation schemes subsidised by the public purse. Will Labour want to stop it? As mentioned in our previous post, residents at Reginald Road handed in yet another petition to the Council last week saying they don't want their homes demolished. They also asked the Council to stop harassing them. This obviously fell on deaf ears, as officers from the Housing Strategy team were back door knocking again within a few days. Not only that, but last week a tenant was told by Lewisham Homes that they would not carry out any repairs and she would have to fund them herself. Lewisham Labour pledge to introduce balloting of estates threatened with demolition in their new manifesto, which is too late for Reginald Road, although since the development hasn't been fully signed off yet there's no reason why it should be. Of course there's no guarantee the officers in charge of balloting won't use the same manipulative (and now bullying) techniques that they're employing now, and twist a majority ballot against demolition into 100% consent. 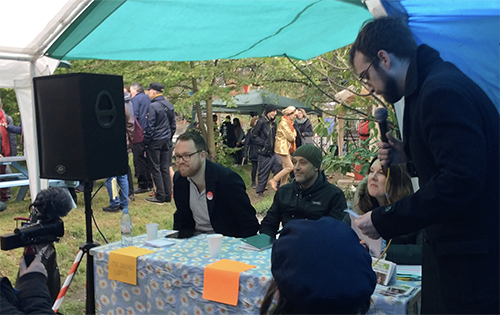 Meanwhile, at the Deptford Hustings held in Old Tidemill Garden last Sunday (watch a recording here), Cllr Joe Dromey repeatedly referred to a young woman he'd met on his campaign door-knocking rounds who is in dire need of re-housing. He wouldn't say which estate she was from but kept referring to her like a mascot (or a trope for his election campaign). Because she had cried in his lap, he was personally guaranteeing she be rehoused. In a perpetual state of campaigning, usually in support of Council policy that goes against his own constituents, in March he was on Facebook saying the same thing: "When we were door-knocking on the Winslade on Saturday, I met a woman who is living in a tiny studio apartment, riddled with damp, with her two kids. All of them suffer from mental health problems, and they were in a really bad way. I'm trying to get them moved, but we have so few social homes, and there is so much need. They deserve a decent home, and this new estate in Deptford will make an enormous difference." While we agree that it must be truly awful for the young mother he met, our first thought is that the Winslade estate is owned by the Council and managed by Lewisham Homes. If the property is 'damp riddled', whose fault is that? The Winslade has recently had "Decent Homes" work done, but as with most of the Lewisham Homes project-managed Decent Homes work done across the borough in the past few years, damp was never tackled; the work was based on desktop stock surveys done by Savills several years ago, with no attention paid to the issues in individual buildings. As Lewisham Homes tenants know full well, complaints about damp are rarely adequately dealt with and tenants are often told it is their own fault (for drying washing indoors for example), when more often than not it's the result of long term lack of repair to gutters, loose roof tiles or chimney flashing, faulty communal walkway surfaces, inadequate ventilation or a leaking boiler from another flat. After 12 years in existence, Lewisham Homes still does not have cyclical programmes in place to solve repetitive problems, and their repairs service can be summed up in short term fixes that lead to long term nightmares – yet they are now in charge of building new homes! Our second thought was "What about the people in Reginald House?!" who have been living with the threat of demolition for ten years – living in fear of displacement and unable to plan ahead – while Lewisham Council have faffed around trying to up affordable homes quotas, chopping and changing their minds, lying to residents, failing to communicate with them properly, trying to pick them off one-by-one, and not once considering the impact of their plans on people. In the early days of so-called 'consultation', Housing Strategy officers reported to Mayor & Cabinet that the scheme had lots of support and the only ones who didn't want the scheme to go ahead were older residents who'd been living there a long time. Well yes, what a surprise! Pesky old people – the ones most invested in their homes, with the most to lose! As one campaigner responded to Cllr Dromey on Facebook, "you are riding roughshod over one disadvantaged community to serve what you perceive as an even more disadvantaged community. It is divisive." Stress, a sense of loss, grieving, poorer mental health and a decline in physical health have been found to occur in individuals who are forced from their homes. Stress can also occur from the anticipation of dislocation and the lack of understanding from the authorities. Qualitative studies in the US have found the sense of bereavement that comes from being displaced is particularly acute among the elderly. In her recent book about the "financialisation of housing" Big Capital–who is London for? Anna Minton documents, among other things, the effects of demolition and displacement on residents at the Heygate, where some people are thought to have died as a result of the upheaval. Academics refer to the 'phenomenology of place' to distinguish 'space' (ie a unit of housing) from 'place' (home). Both home and hometown are intimate places, full of memories, and to dismiss the 'emotional geography' of place simply reduces neighbourhood and home to a spatial commodity or just mere numbers. 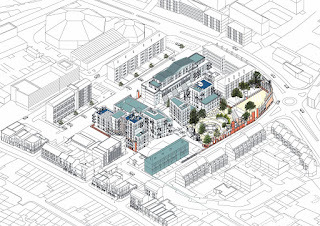 Lewisham Council are offering the Reginald House tenants new homes in the new development. "Look!" they say, "you'll have a lift, you'll have a brand new home! ", but fail to see the difference between opening your front door to the outside world as you have done for years and opening your front door onto a corridor – let alone the extra costs incurred in service charges for maintaining a lift. Or the difference between knowing exactly where your neighbours are, then finding them transferred to a strange new block – or even another town. The exterior of 2-16A Reginald Road has been allowed to become run-down (while the insides have benefitted from Decent Homes work) in what is usually referred to as "managed decline" – or deliberate neglect, as film-maker Paul Sng describes in his film Dispossession: The Great Social Housing Swindle. At Reginald Road, service charges and rent are being paid but no repair work is being done. It's not as though the money isn't there to refurbish homes, it's just being spent elsewhere. An FOI request revealed that in the time that £104,000 was taken from Reginald House residents in rent and service charges, only £126 has been spent on repairs. At Achilles Street in New Cross where 87 homes and 15+ businesses are under threat of demolition in Council-led estate regeneration, the residents made an FOI request to find out whether any money was being spent on their buildings. They discovered that whilst £2,601,009 had been collected in rent and service charges in the past six years, only £248,899 had been spent on repairs and maintenance. The way Lewisham Homes is managing the Council's current stock leads one to suspect that the Winslade estate – where Cllr Dromey met the desperately unhappy mum – is next in line for demolition and "regeneration". Meanwhile, residents at Achilles Street refer to Lewisham Homes as "slum landlords".